Bicheno is a town on the east coast of Tasmania, Australia, 185 km north-east of Hobart on the Tasman Highway, with a population of 853. 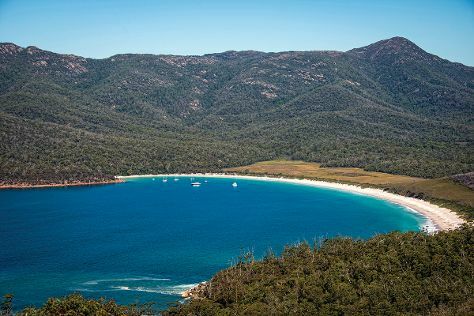 On the 9th (Fri), master the tricky terrain with a 4WD tour, trek along Wineglass Bay Lookout, and then visit a coastal fixture at Cape Tourville Lighthouse. Here are some ideas for day two: see majestic marine mammals with a dolphin and whale watching tour, then view the masterpieces at Gone Rustic Studio + Gallery, and then examine the collection at St Marys Cranks and Tinkerers. For other places to visit, maps, ratings, and more tourist information, refer to the Bicheno itinerary maker. In September, daytime highs in Bicheno are 17°C, while nighttime lows are 4°C.